This beautifully illustrated gift book, filled with inspirational quotes, looks at an emotion that gives our lives meaning: love. “If you are not long, I will wait for you all my life.” —Oscar Wilde. Whether it’s a passion that lasts a lifetime or an infatuation that burns out like a candle, love is the subject that stirs the creativity of every artist, poet, and writer. 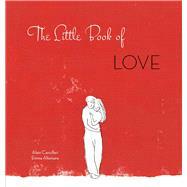 With its superbly chosen quotes, and stunning drawings, this is the perfect gift to give to someone who has your heart. Emma Altomare graduated from the University La Sapienza in Rome with a degree in Communication Studies and attended a post-graduate Master’s program in publishing. She later worked with various publishers, including White Star. After graduating from the Venturi Art Institute in Modena, Alain Cancilleri attended the Faculty of Arts and Philosophy at the University of Parma, majoring in Art History, and then continued his studies at the International School of Illustration in Sàrmede. He has worked as a graphic designer in Tuscany for several years and now lives in Faenza.